Today was the official start of the RTR here in Quartzsite, AZ. My day consisted of getting up and eating oatmeal made with hot water from thermos, heated yesterday. Yes I like my Thermos brand 61 oz. container that keeps hot water hot for 24hrs. At 8:00 I met up with 2 woman walkers from the walking group last year. We returned and after cleaning up now that the sun was up and it was warm. I set up my new solar panel early to start recharging my LiFePo4 battery. 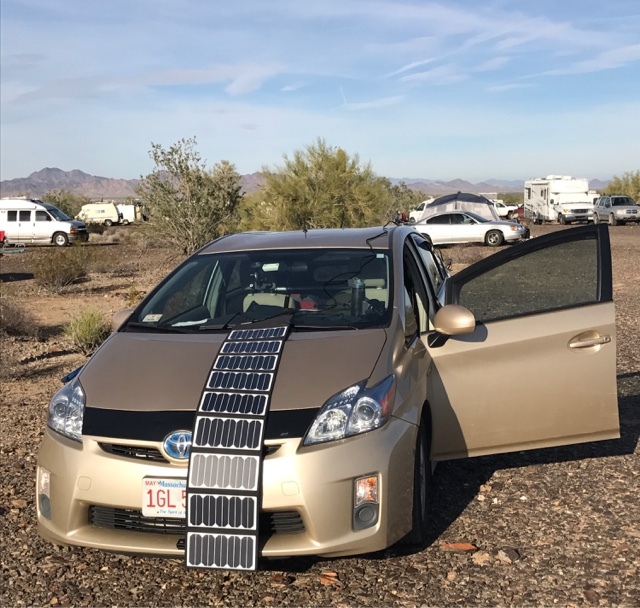 The solar allows for charging from the sun vs the Prius being left in ready mode. At 10:00 leader of RTR Bob Wells, held an informal gathering at the fire pit. There were mostly new people attending and the messages were the same as Bob has been publishing on the CRVL forum. I broke off early and went to get my BLM 14 day pass from the camp host who told me that the RTR had already exceeded last years number of attendees and there was a steady stream of people still coming in. Then to a shop in the center of Quartzsite that Bob recommended that will receive packages for folks for $2.00 if under 50lbs. 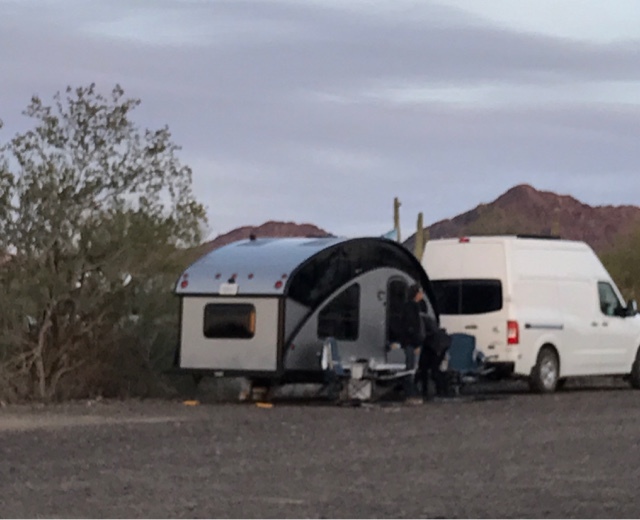 Once I returned I met three more solo woman vandwellers that are new trying out how it is to live part time or possibly fulltime in their respective vehicles. This now makes 7 solo woman travelers near where I parked. I had 5 or 6 people stop by to see my Prius setup and they all had questions but liked by new solar setup. I had to break off from giving tours to meet a friend from last year to help fix some things on her van. We were successful in fixing a power door lock, and greasing noisy hinges today. I need a tool to remove door window crank handles to attemp to find out why one window does not go all the way down. Tomorrow I will search for the tool so I can fix the next item on the list. 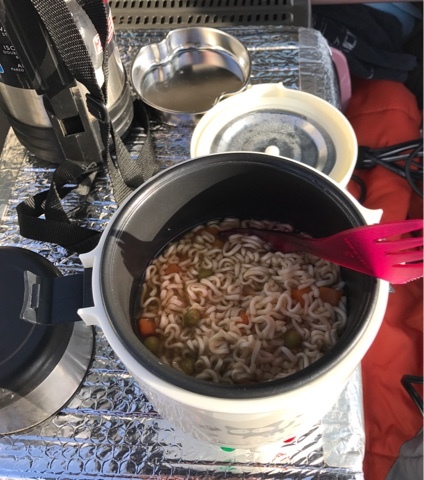 I then made vegetable noodle soup in my rice cooker. Darn this rice cooker saves breaking out the stove for these simple dishes. Then there was more conversations with neighbors, one was from Cape Cod. The above rig is a couple hundred feet away and it has drawn a lot of interest. It is a teardrop design with a way of raising the roof to make more space to live in. I'm told it is made in Canada. Yes. Isn't it a wonderful sunset. I don't tire of them. I walked around and I was amazed by the number of rigs/people here now since yesterday, with more expected to still come. I was making my way to the campfire and stopped to talk to some friends. Then it was on to the campfire where I ended the eve talking to a man from British Columbia. It was a great day although busy meeting and greeting. Good question. I hadn't ordered my inverter as I was with people constantly and it was getting late in the day. So, when I went to order it asked about Dropbox locations, so I clicked check locations and I was shown home locations in Mass, not here even though the ship to address was Quartzsite. Therefore on short time for delivery in two days I just went with the place on Main Street here in town that is a receiving agent and charged $2.00. Subsequently, I have tried to search for a way of finding to look up Amazon Dropbox locations and the Amazon site I got to allows adding an address to search so I put in Quartzsite, AZ and it said no boxes in area. It didn't even say where the closest one is, even if it was in Phoenix. So I searched for a way to see if there was a map of locations and never found any map. It would be nice if they just created an interactive map for looking. That way being in the road and moving every day you could plan a location ahead to have it dropped off at. Yeah I searched for a bit, it does not give you the ability to increase your search radius until you find the closest one. Bummer. Brent, I subscribe to your blog but had not had a chance to keep up lately. I've gone back through several today and want to commend you on your presentation -- both content and style. 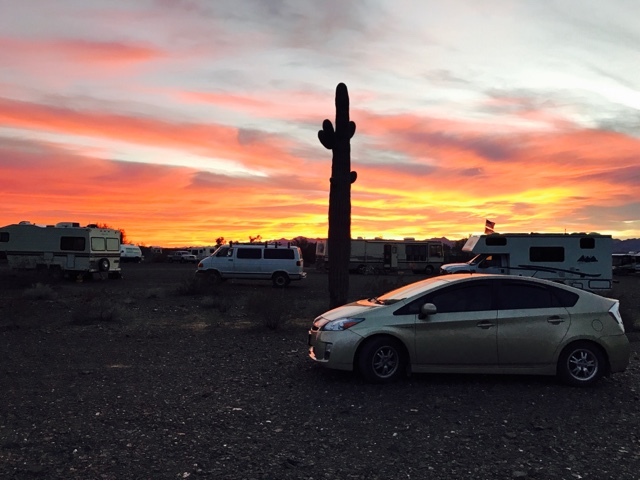 You are doing such a good service for those thinking about vandwelling or new to it. People want to understand how typical days and nights flow -- what one does for fun, how to maintain the "household" and do needed chores, etc. Excellent in telling and showing them! Thank you for the glowing comment. Here at the RTR I am careful about others privacy, so I seldom take pictures and reveal identities. My blog focus is about me day in the life and to keep blog wording short not to loose the reader's interest. I'm glad the style works and appreciate the feedback.